sugar eggs & beautifully blooming easter lilies !! much fun to make with your kids as they are to eat.. So sweet I would rather look at them than eat!! So cute!! I love the ears made form the hard boiled eggs!!! So cute! I'll make these this weekend. So glad I found your blog so I could join! Stop by and join Simply Healthy Family, we'd love to have you and I'm giving away a set of eco-friendly curtains right now! Very creative, they looks adorable..
so cute and wonderful !! yay the sandwiches are back. Just love them! What a cute sandwich ... who wouldn’t want one! So creative! aww....they are both so cute. That chick sandwich reminded me of Chicken Little! Wish I had seen these several days ago! So cute! 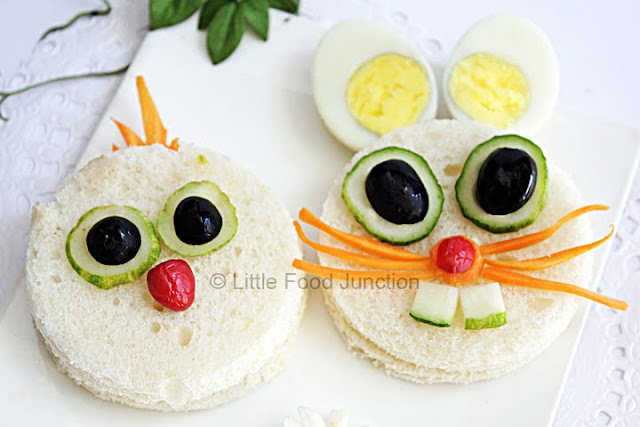 Wow, cute and super creative sandwich..thanks for sharing! Thank-you so much for visiting my blog Smita. I'm so happy to have come across yours. You are an amazing food artist and so talented. I love it! Really cute Easter bunnies.An award awaits you at my blog Smita.